Calls for adjustments to the way the UN Security Council works have grown over the last year in the wake of controversial uses of the veto by Russia, particularly with regard to the situation in Ukraine. Yet it is hard to argue that a better solution exists for this imperfect but valuable institution. 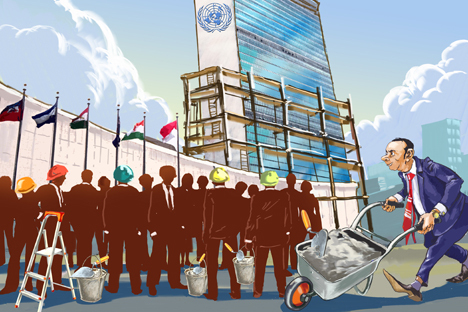 In the last two-three decades the UN has constantly been criticized for its ineffectiveness. As countries have taken to trying to bypass the UN to resolve various international and even domestic problems, people have started talking about the collapse of the entire system of international security institutions and about the distortion of the concept of international law itself, a law that the UN is supposed to be guarding. Seventy years ago, when on Oct. 24, 1945 the UN Charter entered into force, the world was obviously very different. And this charter, which was adopted by the 50 founding countries (Poland also joined the group, becoming the 51st country to sign the Charter before its ratification), was written under the post-war Yalta peace treaty. The Yalta peace treaty no longer exists – it became history after the end of the Cold War. And it was around this time that people started talking about the need to reform the UN so that it would correspond to modern needs. The number of conflicts that have occurred since World War II is already approaching 300. In the overwhelming majority of cases the UN was helpless to deal with these conflicts. Moreover, its helplessness became even more apparent precisely after the breakdown of the bipolar world of the post-WWII order, in which two opposing military-political blocks guaranteed interactivity according to the rules. "Manageability" was guaranteed since the two powers possessed nuclear weapons, weapons of mutual intimidation and restraint. In this sense, it was logical that in the "old world" the permanent UN Security Council members were precisely the five nuclear powers (even though China received this status only in 1972 – earlier it belonged to the Taiwan government). But with the breakdown of the bipolar world the UN has been left face to face not with a unipolar world (even though there are some who would like to call it that), but with a growing multipolar chaos. It has become difficult for the institution, which is not an ideal structure, to counter this chaos. When people talk about reforming the UN, they often say that the Security Council should be expanded and the right of veto that the five permanent members have should be annulled (the Security Council has 15 members: five permanent – Russia, the U.S., the UK, France and China – and 10 rotating members that are elected by the UN General Assembly for a two-year term). The freshest, "softest" proposal that is currently being discussed comes from France, which proposed that the permanent members renounce their right of veto in the event, for example, that there are massive violations of human rights that lead to large numbers of victims. One cannot but note a certain opportunistic element in such proposals. They have appeared at a particular time, as a reaction to Russia's position on Ukraine, in order to deprive it of the right to block various decisions concerning this problem. However, the current situation is obviously a bad advisor for conducting systemic reforms that are needed for the distant future. Today the "tactical decision" seems to be advantageous for some, but tomorrow it will backfire on them. It is no surprise, by the way, that the U.S. has never been and even now is not an ardent supporter of abolishing the right of veto. Anti-American sentiments in the world are strong. After all, it was Washington that, more than anyone else, would use the veto in the last two decades of the Cold War, though the USSR was the irrefutable leader (in more than half of the cases) in the first 10 years of the UN's existence. Russia has always been and will always be an opponent of such a reform of the Security Council. And it is not a matter of maintaining its status. It is that with the UN's weak effectiveness the right of veto urges the leading powers to try and reach a compromise, to agree behind the scenes. By the way, even though the UN has not been successful in the realm of solving military conflicts, in the humanitarian sphere it has achieved certain results. It is with the UN's active participation that smallpox and polio have been defeated almost all over the world and breakthroughs in fighting illiteracy have been made in many countries. Millions of people have also received humanitarian aid, such as in the case of the last tsunami in the Indian Ocean. And even the most fervent UN critic must recognize the fact that without this organization the world would be even worse, even more dangerous, and that there would be many more wars and conflicts. Because, unfortunately, human nature has not changed at all. And will not do so right up to the Final Judgment. Human nature persists towards "non-regulated relations," and not towards the triumph of humanism and humanistic principles in the world. But the UN has nothing to do with this. The author is a political analyst and member of the Council on Foreign and Defense Policy, a Moscow-based independent think tank. Read more: Are Russia and the U.S. on the brink of a proxy war in Syria?